Sverrir Ingólfsson from Ystafell in Iceland sustained serious bleeding due to a vascular malformation. He was left paralyzed in legs and left arm. In 2008 he had major reconstruction of the left hand's function and after surgery he went back to his work and hobby – running the Transport Museum in Ystafell. He used to work alongside his father for years rebuilding and maintaining cars and machines. Despite the severe disease and its effect, Sverrir is now back as the curator and in charge of the continuing organization and growth of the museum in addition to rebuilding and maintaining its artifacts. The main role of the Transport Museum is to collect and preserve machinery for transportation as well as information and photographs from Iceland's history of transportation. Sverrir is working hard and work has certainly proven the most successful rehabilitation tool for Sverrir to gain independence. 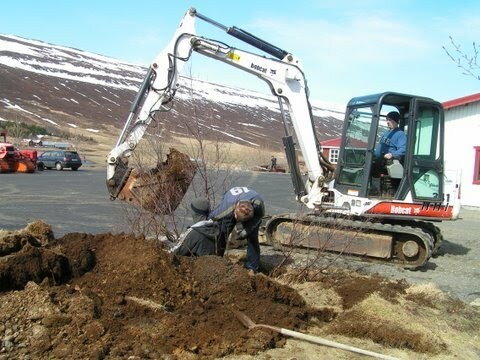 An example of his recovered skill is demonstrated in the picture above showing Sverrir maneuvering his excavator. Note that he has sufficient function of his left hand to control lever arm.